The Knowledge Base for Excel consists of examples and training resources to learn and master the core fundamentals of Microsoft Excel and VBA macro programming. Core Excel fundamentals 1 - Keyboard functions, Cut, Copy, Insert, Delete, Paste Special, Custom Formatting, Undo, Redo, Excel Formulas - The least you should know, valuable functions, different calculations, comments, Drawing toolbar, Edit Replace, Essential Printing, Data Sorting, Hiding, Auto Formats, Protection, Basic Charts, Basic Formatting, IF Function. Core Excel fundamentals 2 - Improved working with Formulas, Worksheet Formulas, Extracting Data for Decision Making, Data Validation, Importing external data. Core fundamentals of Advanced Filters, Auto Filters, Names Charts, Under Utilized Features, Protection, Shared Workbooks, Track Changes, Merging Shared Workbooks, Custom Views, Report Manager, Hyperlinks, Outlining. Core Excel fundamentals3 - Learn Advanced Formulas, Advanced Filters, Text To Columns, Importing Text Files, Pivot Tables 1, Pivot Tables 2, Pivot Tables 3, Scenarios, Goal Seek, Data Tables and Consolidation, Excel on the Web, Macros 1, Macros 2. Core Knowledge chapters and advanced VBA and Macro developments. 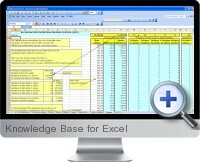 The Excel Knowledge Base also includes an Open Doors membership to either host online meetings and invite professional managers to attend using an online Membership Connect software for question and answer conferences, and receive invitations to just attend member online meetings.